The Life and Adventures of Martin Chuzzlewit (commonly known as Martin Chuzzlewit) is a novel by Charles Dickens considered the last of his picaresque novels. It was originally serialized between January 1843 and July 1844. Dickens believed Martin Chuzzlewit to be his best work, but it was one of his least popular novels. 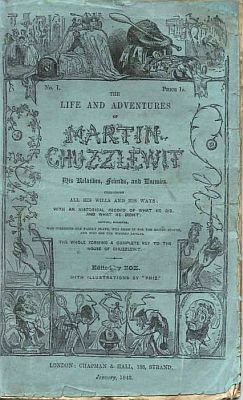 Martin Chuzzlewit was released to the public in monthly instalments. Early sales of the monthly parts were disappointing, compared to previous works, so Dickens changed the plot to send the title character to America. This allowed the author to portray the United States (which he had visited in 1842) satirically as a near wilderness with pockets of civilization filled with deceptive and self-promoting hucksters.